The Trump administration is set to extend "temporary relief aid" to farmers. The Trump administration will extend billions in "temporary relief aid" to farmers who have been impacted by an ongoing trade fight with China and other nations. The move, which includes several types of assistance, could strengthen Trump's political position ahead of his trade negotiations with European Commission President Jean-Claude Juncker on Wednesday. "The actions today are a firm statement that other nations cannot bully our agricultural producers to force the United States to cave in," Agriculture Secretary Sonny Perdue told reporters. “This administration will not stand by while our hard-working agricultural producers bear the brunt of unfriendly and illegal tariffs." "Just be a little patient. They are all aiming for anybody who likes me," Trump told the crowd at the Veterans of Foreign Wars national convention in Kansas City on Tuesday as he spoke of foreign countries who have imposed retaliatory tariffs that impact Trump's base. The administration is keenly aware of the backlash in some Republican circles over the tariffs on steel, aluminum and $34 billion worth in Chinese imports. In response, China, Canada and the European Union have already hit back with their own tariffs - some of which have caused companies like motorcycle manufacturer Harley-Davidson to move production overseas. (Daniel Acker/Bloomberg via Getty Images, FILE) Syngenta Group Co. NK Soybeans are harvested with a Case IH combine harvester near Princeton, Ill., Sept. 29, 2016, this this file photo. Sen. Ben Sasse, R-Neb., who hails from an agriculture-heavy state and has criticized Trump's approach called the plan "gold crutches." Purdue was recently photographed wearing a hat reading "Make Our Farmers Great Again" a seeming play on Trump's slogan "Make America Great Again." Trump wore a similar hat at an event on Monday highlighting American-made goods. "We'll make it up to them. 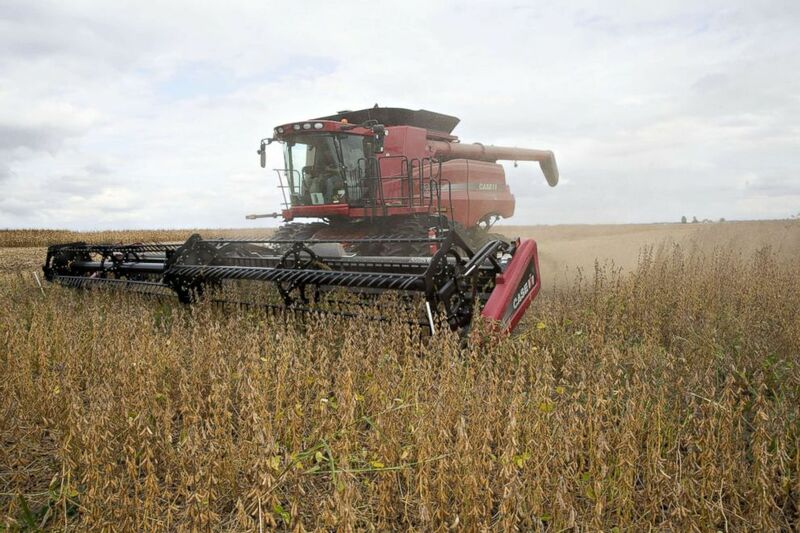 And, in the end, they're going to be much stronger than they are right now," Trump said of farmers back on April 9th after China threatened tariffs on pork and soybeans in retaliating against US tariffs. But Farmers for Free Trade, a bipartisan group that works for trade policies that benefit farmers, said "farmers need contracts, not compensation, so they can create stability and plan for the future." "This proposed action would only be a short-term attempt at masking the long-term damage caused by tariffs," the group's Executive Director Brian Kuehl said in a statement. 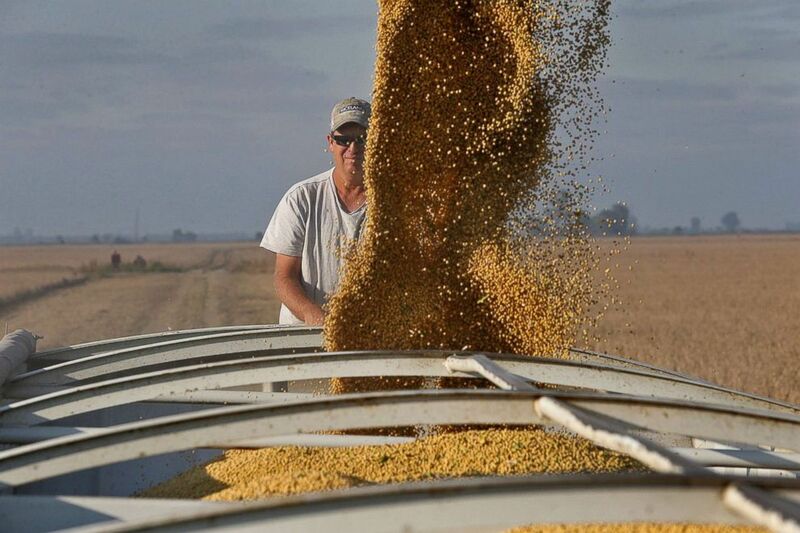 "Farmers can and do weather many storms, but this economic cyclone of tariffs is creating long-term, irreversible damage to the heartland." ABC News' Jordyn Phelps, Alexander Mallin and Elizabeth Brown-Kaiser contributed to this report.